you-beat-you-land Light Up Led Inline Skates Pu Wheels Outdoor And Indoor Rollerblades Rubber Wheels Pack Of 4 White-76mm by you-beat-you-land at 2 Much Fun For Free. MPN: unknown. Hurry! Limited time offer. Offer valid only while supplies last. Detail -Material:PU(Rubber). -Lights'number:4 Led lights. -Hardness:88A. -Size of diameter: 64mm/68mm/70mm/72mm/76mm/80mm. -Bearings:Standard ABEC 608zz inline skates bearings. -Gift box:We send you a colourful gift box,you do not have to pay any money. -4 x LED Inline Skates ripstik,Caster Board Wheels. make water and dirt into the ball bearing, the bearing sealing performance will be reduced. -Frequent exchange of wheel positions will greatly improve their service life. -Do not squeeze the bearing forcefully. Fit for outdoor and indoor. The wheels will light up when you are skating, not batteries need. 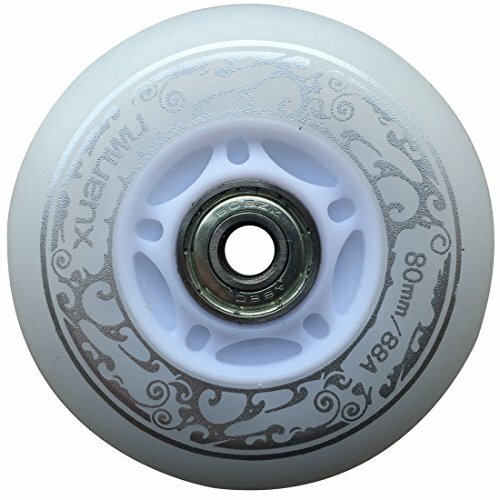 Replacement 88A hardness,64mm,68mm, 70mm,72mm,76mm and 80mm.Suitable for Inline Skates,ripstik,Caster Board. If you have any questions about this product by you-beat-you-land, contact us by completing and submitting the form below. If you are looking for a specif part number, please include it with your message.